• Hot melt rubber adhesive aggressively adheres to corrugated boxes and provides an excellent resistance to moisture and impact resistance. 1.6 MIL – tensile strength 24 lbs. per square inch – 2” recommended on cartons under 40 lbs., 3” under 50 lbs. 1.8 MIL - tensile strength 25 lbs. per square inch - 2" recommended on cartons under 45 lbs., 3" under 55 lbs. 2.0 MIL – tensile strength 30 lbs. per square inch – 2” recommended on cartons up to 50 lbs., 3” up to 60 lbs. 2.5 MIL – tensile strength 35 lbs. per square inch – 2” recommended on cartons up to 60 lbs., 3” up to 70 lbs. 3.0 MIL – tensile strength 46 lbs. 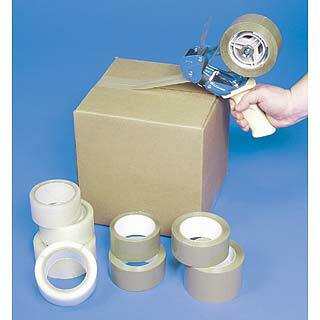 per square inch – 2” recommended on cartons up to 70 lbs., 3” up to 80 lbs.